With the holidays coming to an end, many companies are beginning to take down their festive decorations – whether that is Christmas trees, tinsel or in this case parking bay markings. Our client called us up requiring our road marking removal services for their festive road marking in their parking spaces. Road Markings are vital for a whole range of reasons including for roads (probably one of the main reasons), school keep clear markings, airports and parking bays. Road markings are relatively easy to put down but its the removal that takes the time. One of our services which we provide is Road Marking Removal so we were happy to take on the task of removing the festive road marking for our client, although we did feel a little like the Grinch! Road markings can be quite troublesome to remove and without the proper equipment can even seem almost impossible. To provide a high quality and efficient road marking removal we use High Power Industrial Water Jetting. What is Road Marking Removal? Whether we are removing a festive road marking or a school keep clear marking, there is always a need for road marking removal. Companies are often changing, expanding or moving to new locations, roads often add extra lanes and so on, so the need for road marking removal is constant. 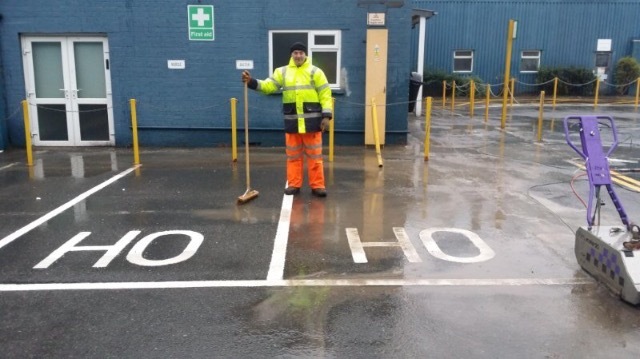 If you need a company which can supply you with road marking removal equipment and the proper training or simply complete the service for you then contact Hydroblast directly. No matter how large or small your task is, we are always happy to provide our services to those in need of road marking removal. Learn more about Road Marking Removal here or if call us for a quote today.